Committing to one person can be scary, especially if you’re a restless dater. Elina Furman, author of KISS AND RUN, shares her tips on putting a stop to your fear of commitment. After a few weeks or even months you find yourself getting a little bored. He’s great and all, but well… you know. So you start scrolling through the online dating ads just to see what you’re missing, and you start thinking, “Hmmm . . . maybe I can do even better.” Or you’re out with your friends when you notice a hottie in the corner and start wondering what he looks like in his boxer briefs. At some point, no matter how much in love, we all have a tendency to wonder what it would be like to wander. #1. We always want what we can’t have. When you’re dating, you can’t help but drool over every cute guy who crosses your path. But as much as you don’t like to think about it, one of the main reasons they’re attracted to you is precisely because you’re taken. Believe me, there’s nothing more alluring about a man or woman than the aura of unavailability. Just remember that if you were single, you probably wouldn’t date half of them, nor would they date you. If you’re happy with your guy and are trying to make a go of it, resist the urge to browse online sites to see what else is out there. It might seem like a harmless way to spend a Sunday afternoon, but it only adds fuel to your commitment-phobia. After all, if you’ve been looking to date a Fortune 500 CEO at the top of the power list and actually start dating him, there still might be a cuter one next year who ranks even higher. Moral of the story? No matter what your criteria, there’s always going to be someone who matches it better. #3. Water your own damn grass. #4. Don’t look over your shoulder. If you’re with your guy, give him your undivided attention. Acting like the poster girl for ADD and flirting with other guys won’t make you seem happier, vied after, or confident, just egotistical and vain. 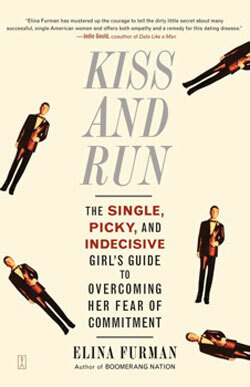 Find more about dating in KISS AND RUN by Elina Furman! Excerpted from Kiss and Run by Elina Furman. Copyright © 2007 by author. Used by permission of the publisher. All rights reserved. Photo by Jared Sluyter on Unsplash. For years, it was the men who had the monopoly on commitment-phobia. Today, single women are the fastest-growing segment of the population, with over forty-seven million single women in this country and twenty-two million of them between the ages of twenty-five and forty-four. Whatever the reasons -- fear of divorce, increased financial independence, delayed motherhood -- more women than ever no longer feel the urgency, or the ability, to settle down. Lucky for this growing group of women, author and former commitment-phobe Elina Furman has written Kiss and Run, the first-ever book about female commitment anxiety. Filled with fun quizzes, first-person testimonials, and step-by-step action plans, Kiss and Run includes the top-five panic buttons, advice for curbing overanalysis, and tips for fixing negative commitment scripts. 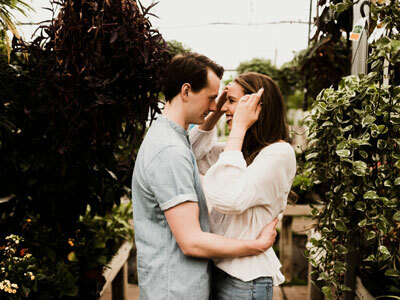 You'll also find the seven types of commitment-phobes, including the Nitpicker, the Serial Dater, and the Long-Distance Runner. Based on the stories of more than one hundred women, this straight-talking guide helps single women conquer commitment anxiety and say yes to love.